You are here: Home / Restructurings / Nifty Products, Inc.
Steel Horse Holdings, Inc. ("Holdings") was a holding company for subsidiaries engaged in the design, manufacturing and distribution of automotive parts and accessories. Holdings was in financial distress due to challenges arising from its entry into the mobile electronics market and its transition from a distribution to manufacturing company. Nifty Products designed, manufactured and marketed branded custom molded floor mats. Professionals of M&A Capital were hired to conduct a marketing process to identify, educate and negotiate with the most qualified financial and strategic buyers. All viable potential candidates were promptly reduced to the highest value, most qualified buyer. 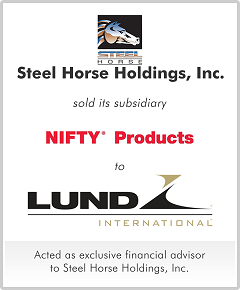 The sale of both Nifty and Steel Horse were completed within four months of engagement.